A few months ago, I was sent a Töbo Track to review on my blog – this was a toy that Sarah had heard a lot about, and so we were excited to see how Caleb would enjoy playing with it. Tobo Track is an exciting new way to build roads and tracks for toy cars and trains. 12 identical pieces are included with each set, and can be joined together in hundreds of ways to create a track that goes anywhere you want it to. Every hexagonal piece has a straight section, a curved section and an intersection – and can be connected to any edge of any other piece. Its a fun way to use creativity while playing with toy cars and trains. When you’re playing with a Töbo Track, you really feel like he’s accomplished those 3 principles in the creation of this toy. The toys are made from wood – and so it’s a completely safe toy, free from toxins or oil-based chemicals. And it’s also from scrap wood – wood that would have been thrown away otherwise – so it’s a toy that is great for the environment as well. This is a toy that even I have a lot of fun playing with. Each of the tracks has a great texture and feel to it – and I know it’s not something that Caleb is going to be able to break at all. It’s very sturdy. I also love the educational component with the numbers on all of the sides of the tracks, which means that it’s a toy that can be used when Caleb gets older as a fun way to work on mathematical skills. The Töbo Track comes with 12 identical track pieces and a cute wooden toy car – which Caleb especially liked when he first opened up the Töbo Track. In fact, the only complaint that Caleb had with the toy is that he wished there were more pieces to it. You can make a lot of track options and designs with 12 pieces, but I also wished that I had bought a 3-4 sets so that we could have made some really long tracks. 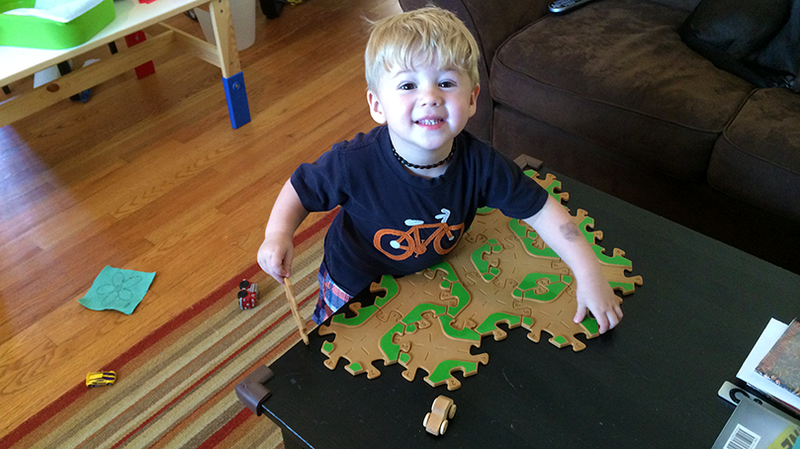 Caleb has really had a blast playing with his Töbo Track. He loves seeing what kind of road shapes he can make with the tracks – I’m hoping that perhaps he’ll get another set or two for Christmas so that he can make a much longer track and keep enjoying this toy. The only comment that I might make about the product (which didn’t affect me since I was given a set to review) is the price. The Töbo website shows a list price of $59.95 and offers it for $49.95. However, you can get it on Amazon for $35, but even that feels a little steep. However, for being a safe, toxin-free toy that is made out of recycled wood material…$35 is probably a pretty good price for it. If your child loves cars as much as Caleb does, and if you’re looking for a good present, I would highly recommend the Töbo Track. Below is just a short compilation of Caleb and I playing with the Töbo Track. Enjoy!